Somehow, Final Fantasy XIV has become one of the best Final Fantasy games in recent memory, thanks to a bunch of winning factors that elevate it from the ranks of MMO dreck to a game that’s worth playing even if you’re by yourself. One of those factors: It doesn’t take itself too seriously. Sure, there are crystals and heroes and all of the melancholy things you might expect from an FF game, but Final Fantasy XIV is often just as happy to get weird. Characters in the game will send you on tongue-in-cheek fetch quests, goof around with emotes, and subvert your expectations in some funny ways over the course of the game’s many, many quests and stories. During an interview at E3 earlier this month, I asked director Naoki “Yoshi-P” Yoshida how he draws the line for this stuff. Have they ever come up with ideas or quests that are just too weird? Where do they find a balance? 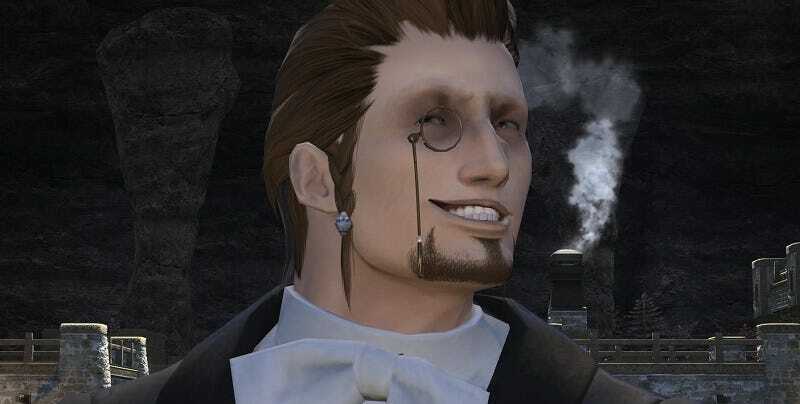 The Hildibrand quest, of course, is a chain of preposterous sidequests centering around the comic relief character Hildibrand Manderville. They’ve become fan favorites over the past two years, thanks to dapper zombies and Hildibrand’s penchant for getting himself into the most ridiculous situations possible. I also asked Yoshida about future content. Final Fantasy XIV has long seen a steady flow of content updates—and in just a couple of weeks we’ll see the crazy-looking Deep Dungeon—but what about the next big expansion pack? That next expansion will be announced at the Fan Festival in October, Yoshida has said. He wouldn’t say what the theme will be, but he did note that they’ve got a “rough ballpark estimate of the flow” of new content updates—4.x, they’ll be called—that we’ll see over the next couple of years. I also asked Yoshida if he has a master plan in mind for the game—if he already knows how Final Fantasy XIV’s overall story will end. “It’s an interesting question you ask, because this is an online game that we would love to continue for as long as we can, so in other words, it’s supposed to be perpetual,” he said.